Beyond The Wizard of Oz‘s suicidal munchkin or Pink Floyd alignment, beyond Three Men and a Baby‘s curtain ghost, beyond the choice phrases hidden in Who Framed Roger Rabbit, there exist the conspiracy theories and urban legends attached to The Shining. More than any other movie has Stanley Kubrick’s 1980 masterpiece inspired oddball (perhaps ingenius?) speculations from fans. The impassioned community has spawned conversation about the film’s story and production alike, many of which are showcased in the 2012 Sundance Film Festival debut Room 237. The nonfiction piece collects a mass of Shining theories, touching upon the film’s goofs, what happens when you sync up a forward play of the movie with a backward one, and how it might very well connect to the alleged moon landing. The gripping, minimalistic new trailer for Room 237 introduces the attitude it will take in approaching The Shining: dark, haunting, meticulous, and fervent. All perfectly appropriate for the source material. Check out the new trailer below. 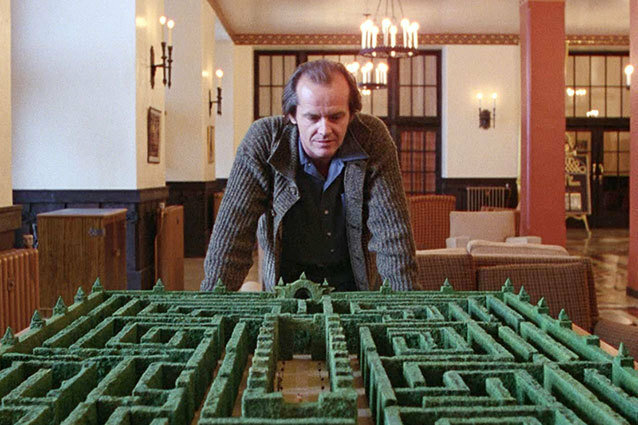 Room 237 reaches theaters Mar. 29.